Capture primarily involves accepting and processing images of paper documents from scanners or multifunction printers. 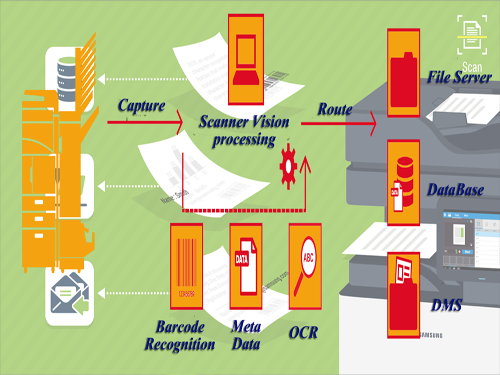 Optical Character Recognition (OCR) software is often used, whether integrated into the hardware or as stand-alone software, in order to convert digital images into machine readable text. Optical Mark Recognition(OMR) software is sometimes used to extract values of check-boxes or bubbles. Capture may also involve accepting electronic document. Metadata is typically stored for each document. Metadata may, for example, include the date the document was stored and the identity of the user storing it. The DMS may also extract metadata from the document automatically or prompt the user to add metadata. Some systems also use optical character recognition on scanned images, or perform text extraction on electronic documents. Descriptive metadata : Descriptive metadata uses individual instances of application data or the data content.The main purpose of Digismartek metadata is to facilitate in the discovery of relevant information, more often classified as resource discovery. Metadata also helps organize electronic resources, provide digital identification, and helps support archiving and preservation of the resource. Publishing includes the following stages of development: acquisition, copy editing, production, printing and marketing and distribution.